Dharma Son Collective - "Antipodes of Fallout"
From Pittsburgh, PA, Dharma Son Collective describe themselves as an experimental/avant-garde band that cross psychedelia with the ideals of 60s/70's space rock, influenced by the likes of Amon Düül I & II, Ash Ra Tempel, Can, Soft Machine, Faust, early Pink Floyd, Guru Guru, Acid Mother's Temple, Miles Davis and more. All exciting stuff for Aural Innovations readers. But with members as young as 14 and 16 years old, I was even more interested to hear the music these guys would create. Someone is doing a good job of exposing the up and coming generation to good music, and much of it under the same roof as three members of this quartet are brothers. The lions share of disc one is taken up by the 43 minute "Kafka Boogies at Sunset", which starts off with twin jamming psychy Blues guitars accompanied by flying saucer synths. The electronics are harsh and totally spaced, much of it sounding like effects right out of a 50's sci fi flick, which sounds pretty wild alongside the rocking guitars. The guitars evolve and mutate, eventually drifting away from the almost standard rock jam into an acid laced spaced out psychedelic freakout that fits more comfortably with the synth work. The entire jam is a journey through a multitude of the band's influences, from traditional early 70's Pink Floyd/Amon Düül II/Guru Guru styled excursions to more experimental sound textural noise-psych, Eastern influenced trip ragas and more. Kind of like a tripped out glom of "Set the Controls for the Heart of the Sun", ADII's "Yeti" and Guru Guru's "Space Ship". These guys go into the stratosphere, I'll give them that. The playing is a quite raw and the band often struggle to consistently maintain cohesion throughout such a lengthy recording. Yet it's clear that these are musicians who are exploring, experimenting, learning, and just generally digesting the music that, for at least some of them, must be recent and exciting discoveries. The remainder of disc one consists of 5 considerably shorter and more purely avant-garde tracks, mostly space-ambient, drone and a general sound-art and free-improv aesthetic. Disc two includes 3 lengthy sonic expeditions, starting with the nearly 30 minute "My Dharma Sun & Eye". The music is a mixture of freeform jazz-psych organ, drones and soundscape freakout guitars jamming away. Of course things quickly descend into considerably more lysergic territory as the music becomes distorted and is joined by the band's now trademark free-wheeling experimental fun with sounds. It all gets quite freaky jazzy at times, like acid psychedelic Sun Ra or something along those lines. The last 40 minutes of disc two are taken up by "We Whispered In God's Left Ear" and "Nervalian Transparency", both of which are a bit different and took me by surprise. "We Whispered In God's Left Ear" consists of folky strumming acoustic guitar, a laid back rolling bass groove, plus assorted bells and efx'd voices, and is the trippiest track of the set. "Nervalian Transparency" begins once again in the acoustic realm, and reminds me of some of the music from Daevid Allen's Now Is The Happiest Time Of Your Life album. But after a few minutes it veers off into a dark and intense cosmic progressive rock injected atmospheric realm that sounds like an avant space rock combination of mid 70's King Crimson and Univers Zero. Not only are they in a somewhat different direction than the rest of the album but they are also the most linear tracks of the set, having a confident direction that was sometimes lacking on the other lengthy tracks. Overall this is an ambitious 2-CD set of jams. 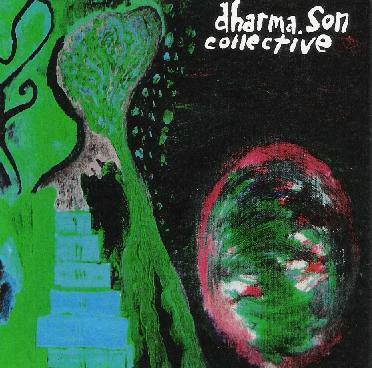 And while Dharma Son Collective have a ways to go, they're off to a hell of a start, certainly for the framework they've chosen to work from. Diving in with an open mind and a desire to be taken elsewhere makes this a pleasure to listen to, and I can only imagine where continued practice and experimentation will take them. I'll be looking forward to hearing the next phase. Antipodes of Fallout can be purchase through CD Baby at http://cdbaby.com/cd/dharmasonc. Email Dharma Son Collective at: Seer817@aol.com.